I got Andrew Blackman’s ‘On the Holloway Road’ by mail a few days back and as soon as it arrived I dropped whatever I was reading and started it. I finished reading it yesterday. Here is what I think. ‘On the Holloway Road’ is narrated by a writer called Jack. Jack is working on his big, complex literary novel but it is not getting anywhere. One evening while he is having dinner at the kebab shop near his home, a man walks in and comes and sits at his table, uninvited. Soon the two start a conversation. The new man is called Neil. Before he knows Jack becomes thick friends with Neil and both of them go back to Jack’s home. The next day they pack their stuff in Jack’s car and leave for a long drive to the north – to Scotland and beyond to the North Sea – in search of adventure. They meet some interesting characters during this trip. But more interestingly, they have long conversations on life and its meaning. Do Jack and Neil find adventure on this trip? Who is this mysterious Neil? Does Jack find inspiration to complete his novel? And in today’s world, where stepping back for a moment from life, means giving up one’s position in the race, does going on this long road trip adventure end well for Jack and Neil? The answers to all these questions form the rest of the book. I loved ‘On the Holloway Road’. At one level it is a ‘road-novel’ and describes the adventures of Jack and Neil during their trip from London to the Outer Hebrides. At another level it is a meditation on life and its eccentricities and on the tussle between freedom and the desire to conform. It is also a commentary on modern times when everything is planned and regimented and spontaneity is absent most of the time. Some of my favourite parts of the book are where Jack talks about the writing process – on the way novels are structured these days based on publisher’s requirements or the latest fad, on how it is easy to write hundreds of blog posts but difficult to write one novel, on how aspiring novelists leave fulltime, dead-end jobs to write their magnum opus but then discover that inspiration which seemed to be ever-present has suddenly taken flight and the days and months pass in a rapid sameness one after the other. The first three pages of the last chapter touched my heart deeply and are some of the most beautiful that I have read. Andrew Blackman’s writing is beautiful and my highlighting pen didn’t stop working. I could identify with most of what the main character Jack thought and said. I also liked the character of Jack’s mother and two of the characters who come later in the book, Eileen and Nicola. There were a few sparks between Jack and Nicola – or rather they were not really sparks but the warmth that envelops two people when they sit in front of a fire on a winter evening having a glass of wine and talk about books and literature and life – but unfortunately, things don’t end as expected. The ending is sad, not just because of what happens, but because of the situation that Jack finds himself in. It feels very real. ‘On the Holloway Road’ is one of my favourite reads of the year and probably one of my favourite books of alltime – up there with Somerset Maugham’s ‘The Razor’s Edge’, Hermann Hesse’s ‘Narcissus and Goldmund’, Muriel Barbery’s ‘The Elegance of the Hedgehog’ and Linda Grant’s ‘When I Lived in Modern Times’. I think I will read it again – atleast my favourite passages. I can’t wait for Andrew Blackman’s next book to come out – ‘A Virtual Love’ which is slated for release next year. If you are particularly foolish, you will become one of those writers or artists who spends their whole career trying to describe or recapture that fleeing glimpse, which everyone gets once but only once, and like Shakespeare and Van Gogh and Schiele and Steinbeck and Nadas and Hendrix and Borges and Soyinka and Cervantes, you will fail to describe anything but a small individual corner of the vast reality you thought you saw. All your work will be a pale shadow of what you know to be possible, and when you realise it you will either wish yourself a shopping drone like the people who shuffle around you or, like Hemingway, you will kill yourself. …I thought of my long half-finished novel sitting on my laptop and it seemed worthless junk, a mass of zeros and ones entered at great cost and being stored for no reason. My novel bore some relation to other books but none to life, and it swayed uncertainly between stubbornly esoteric intellectualism and slavish aping of the latest publishing fads, depending upon how desperate I was for publication at the time I happened to write each section. The result was an incoherent mess, self-righteous on one page and craven on the next. It needed massive revision, but first it needed to be finished, and how could I finish something so confused? “It’s about praxis, Jack,” he continued. “I was reading about it the other day. No thought without action, no action without thought. That’s the problem. Too many people just acting without any thought at all, eating, shopping, working and dying without ever wondering what it was all about. That’s not life, Jack. That’s prolonged death, a long slow painful suicide from a poison that spread through the body the minute that person decided, some time early in life, to give up on fruitless dreaming and just be practical. And then the people who are examining life, the priests and philosophers and gurus, are not living it, so they can’t possibly understand it either. So our quest, Jack, is to live and dream and examine at the same time. Thought and action – combined and inseparable. Praxis. It’s hard to do, but the alternative is death. Neil did quite literally talk in the same breath for minutes at a stretch, not leaving even the slimmest of cracks between each word, so that a conversation with him seemed like just one long word running on for mile after mile and containing all the elements of a fully rounded story. I thought about all the moving parts in each of the ferries and each of the cars, and how many people had been involved in making that little scene possible, from forging the bolts in the ferry’s hull, to drawing up the timetable, to putting petrol in the cars at some distant station in the Highlands, or even back in England, and the possibilities soon multiplied beyond comprehension. I started to think about who had delivered the petrol to the service stations, who had drilled for the oil, who had built the car, who had designed the car, who had invented the petrol engine, and so on and on until I realised that if I stood on this dock for long enough I could cover all of human activity across the world both at this moment and throughout history. And I could show how it all was necessary for this one little scene at a remote highland ferry terminal to be playing out as it was. Change one element and you change them all: the cars look different, or they arrive later or earlier, or they are not cars at all but some alternative means of transport that runs on betel juice. 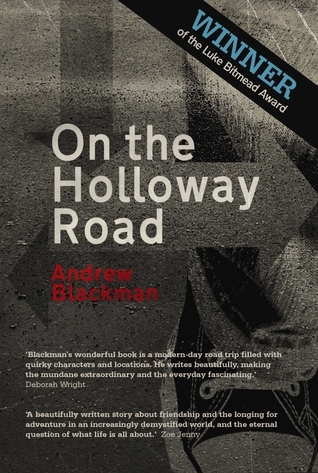 Have you read Andrew Blackman’s ‘On the Holloway Road’? What do you think about it? I’m so glad you liked it as much as I did. I even liked it too much for reviewing it as I do not enjoy writing too personal posts but I mentioned it on my best books of the year list. I made almost the same trip a few years ago. That’s one of the things that stunned me. It was almost eerie. I’m looking forward to his next book. I remember seeing it in your favourite books of the year list. I wish you had posted a review though 🙂 I would have loved to hear your thoughts and read your favourite passages. Interesting to know that you did almost the same trip a few years back. This book must have brought back those memories alive. I read it too and I was very touched by the ending. There’s a review on my blog. Glad to know that you liked the book too, Emma. I somehow missed your review. I will read it soon. Thanks for telling me about Jack London’s book. I will look for it and I will also read Jack Kerouac’s book. It is interesting that London wrote a ‘road’ novel set at the end of the 19th century. He also wrote a book on the travails of a young author. He seems to be a very diversely talented writer, but unfortunately he is more known for novels like ‘White Fang’ and ‘The Call of the Wild’. There are reviews of The Road and On The Road on my blog. In The Road, London relates his real trips as a hobo in the USA. Jack Kerouac had The Road in mind when he started travelling in the USA with Neal Cassady. On The Road is his experience but he changed the names of the persons. I think Andrew had On The Road in mind when he wrote On The Holloway Road, parallels are clear in his novel. Thanks Stu! It was a really wonderful book. Thanks Vishy, this is really interesting to me. I’m writing a dialog-driven novel with two characters. A man and a woman in their late twenties go on a rail trip together and discuss life and everything else. The dynamic will be different and there’s room for some romance. I’ve been looking out for any books with a similar theme, but it seems that road (or rail) trips are more of a movie genre than a literary one? If you know of any similarly themed books please let me know. Thanks for telling me about your novel, Marcus. It sounds fascinating and I would love to read it when it comes out. When is it coming out? It reminds me in some ways of the movie ‘Before Sunrise’. I agree with you that road / rail trips are more a movie genre than a literary one. I don’t know many ‘road’ novels other than Jack Kerouac’s book and now Andrew’s book, though I know of nonfiction travelogue books which are on this topic. I remember though seeing an anthology of ‘road-stories’ sometime back called ‘The Mammoth Book of Tales from the Road’. It looks quite interesting. Vishy, you hit the nail on the head with Before Sunrise. That film is certainly a major influence, together with some of the films of Eric Rohmer. I hope to have the book out between September and November. However, I am not seeking traditional publication. I’m going to try crowdfunding (micro-patronage may be an equally fitting term). The book will be professionally produced by hiring a cover designer and editor(s). What interests me about this process is the direct connection between author and reader. I will soon publish an excerpt of 20-30 pages as a sample for people to decide whether they are interested in the book. The internet enables authors and readers to enter a more interactive relationship. As one of the crowfunding rewards/perks, I plan on inviting readers to suggest topics discussed in the book, or have a “cameo” role in the book. If you would like to read the initial excerpt, please add your email address to my mailing list. I will notify you when the excerpt is ready. Just clicking the Newsletter or Contact link on my blog. I would be very pleased to hear your opinion, and that of your blog readers. I have a cover design for the book now and would be interested in your thoughts. I cannot post it publicly though yet. If you are interested in taking a peek, drop me a note via the Contact link on my blog. I will then email you the link. There is The Road by Jack London and On The Road by Jack Kerouac. I knew because my comments landed in spam on Caroline’s and Guy’s blogs. Thanks Emma. I have read Kerouac’s On The Road. It was an interesting journey. I had forgotten about Jack London’s book. Thanks for the reminder. What I’m writing is a novel more in the vein of the movie Before Sunrise, as Vishy recognised (see comment above). If you think of anything like that, please let me know. And if you’d like to read the initial excerpt or follow the crowdfunding adventure you are welcome too. I think this is one of your best reviews, Vishy. I’m glad you liked it – I have yet to get my hands on this book but it will happen eventually. I like the passage about praxis – to achieve that balance between being practical and dreaming, or is it rather making your dreams reality? Glad to know that you liked the review, Delia. Hope you get to read Andrew’s book and like it. I will look forward to hearing your thoughts on it. That passage on praxis is wonderful, isn’t it? I liked your interpretation of it – achieving perfect balance between dreaming and action and hence making dreams a reality. Hope you get to read this book and like it, Jo. Will look forward to hearing your thoughts on it. Sorry your comment went into spam. It has never happened before. I just retrieved your comment back. After this new WordPress update recently, lots of weird things are happening. I just finished my first road novel! I’m amazed at how I felt like I too was embarking on a roadtrip adventure! (I know that’s how reading works but as someone who hadn’t read any travel novels, it was a novel (har har!!) experience. I remember reading this review last spring and thinking that I would like to read this book. After reading the review again I KNOW that I must read it! Thank you for your beautiful review of this intriguing book, Vishy.